Do you have menu for special day? 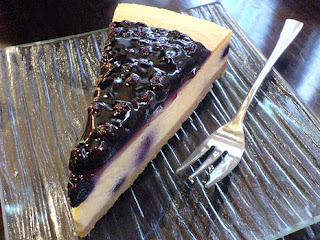 I have delicious menu for you is blueberry cheesecake. This menu for vegetarian, it’s easy for cooking and delicious. That is good idea for vegan. 1. Combine crumbs, 2 tablespoons sugar and butter. Pat mixture into the bottom of a 9 inch springform pan. 2. Mash cream cheese until soft and creamy. Gradually beat in sour cream, 3/4 cup sugar, vanilla and flour. Beat in eggs one at a time. 3. Pour mixture into crumb-lined pan. Bake in a preheated 325 degree F (165 degrees C) oven for 1 hour or until firm to the touch. 4. Cool and then remove cake from pan by loosening edges with a knife. Place frozen blueberries on top of cake. Melt jelly and spoon over blueberries to glaze. Chill until ready to serve.